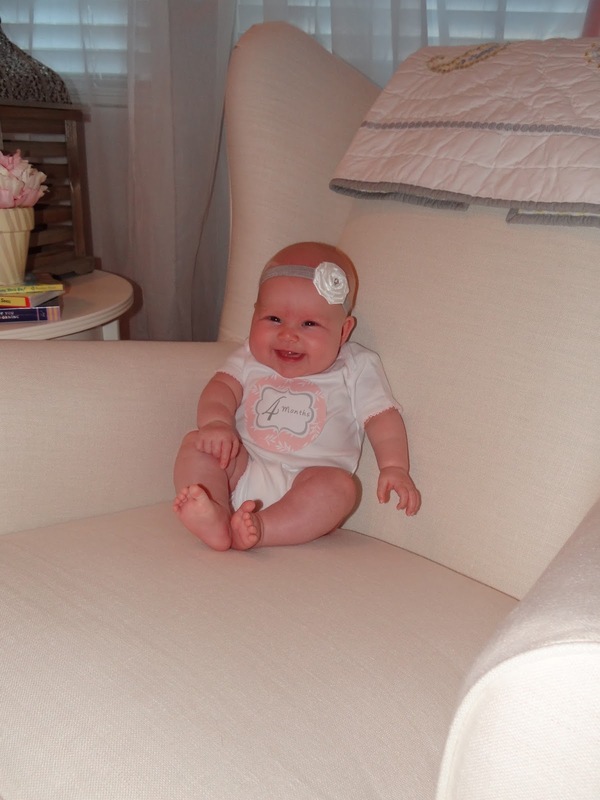 Then I Got To Thinking...: Dear Andie... You're 4 Months Old! Wow! 4 months old you are already. I know I write this to you every month, but it seems impossible to me that you've already been in my life for 4 months. In some ways, I feel like I have known your beautiful face, sweet stares, and precious smile my whole life... but in other ways it feels like I just held you for the first time yesterday. You bring so much joy and love to us every single day. You smile all the time for us, your effort at giggling makes us laugh, and you radiate so much emotion in your facial expressions. I can tell when you're smiling just by looking at your eyes. This was a big month for you. Your brand new cousin, Stella, arrived on August 23rd. You came to the hospital to meet her on the day she was born and were such a trooper while we spent time at the hospital waiting for her. You have started rolling over and becoming very mobile because of it. You roll in all directions and can go about 5 feet. A few mornings ago, you rolled right into a piece of furniture and it made a huge "thud", causing daddy and I to jump up and make sure you were okay. The noise scared you more than anything, but it's hard to believe how active you are. You haven't been a big fan of the carseat for about 2 months now. We moved you into your "big girl" carseat this month which has helped a little bit. We have also joined "Mickey Mouse's Clubhouse" and you can be entertained by watching that. I also learned that you need to be fed, clean, and a little sleepy to enjoy the car. You love watching the ipad and tv - especially sports, which daddy loves. We think you are a strong baby. You can hold up your head to look around (and you're very curious about all of your surroundings) and you love to stand up. You can hold all of your weight on those teenie-tiny feet! You make all sorts of noises, coos, and sometimes you "yell" at us! You also talk to us and go back and forth with noises when we copy you. You're still maintaining the "Misses Demandie Andie" nickname when you get fussy and want us to hold you and walk around. We're trying not to let you manipulate us too much, but goodness, it's hard not to be! You love to chew on blankets, fingers, arms, toys, anything you can get your mouth on. You figured out how to use your hands to put everything in your mouth, including your paci. You've found a new joy in sucking your thumb, although you don't do it everyday. You play on your activity mat a lot and sit in your little swing. It's amazing to see the developmental changes that have happened in just a month. You're so much more aware and alert. We added another name to your list of nicknames... "blow out baby". You typically have at least one poopy outfit-changing diaper a day. But your record so far is 4. You moved to size two diapers about a week before you turned 4 months old. You're wearing mostly 0-3 month and 3 month sized clothing. We aren't sure how much you weigh, but we will find out at your 4 month check up this week. You love taking baths still and started taking them with me in the big bath tub. You kick your feet and splash with your arms. It's adorable! Everyday I look at you and I can't get over how cute you are. Your little legs and body are just adorable. I just want to hug and squeeze you! You have the sweetest little chubby cheeks and petite facial features. My girl, you are such a treasure to me. I love you so very much. I am treasuring these moments with you. You are beautiful and I am so proud you are my baby. We never got you in the pool, but we had to dress you up in your suit! Your first niners game... we beat the Packers!! What a cutie. I'm glad watching shows while in the car is helping a little. I don't know what I'd do without bubble guppies on the iPad! Though now I catch myself singing the songs randomly throughout the day! O my goodness! 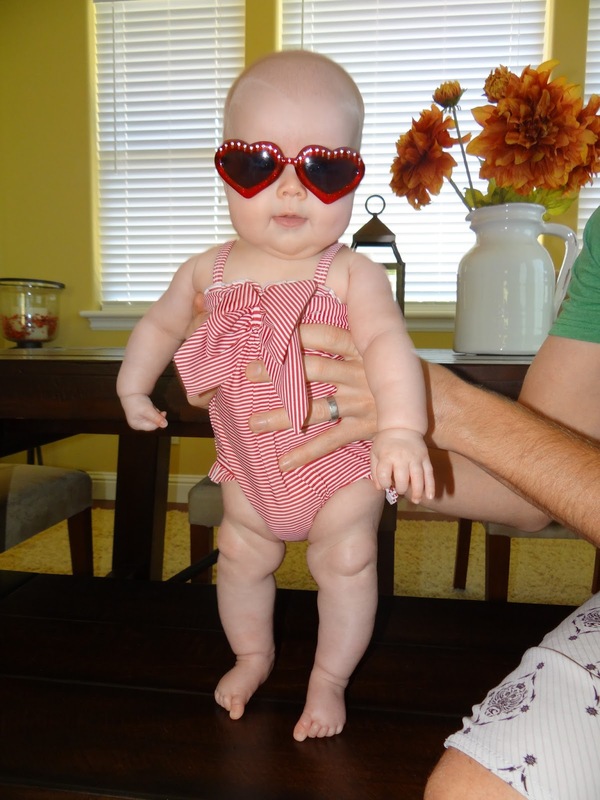 Andie in her little bathing suit is simply adorable! LOVE her - happy four months!!! Oh my goodness, Andie is so precious and beautiful! I can't wait to meet her! Time sure flies! Enjoy each.and.every day... She is so adorable Tracy!!! THOSE CHEEKS! Ahhhh! They are too much! What a sweetheart! Happy 4 months, little one! Her suit is to die for!! !